The reader: Few modern writers probe the nuances of human relationships as astutely as Curtis Sittenfeld, even though few of the relationships she depicts are likely to leave readers swooning. Her debut novel, Prep, was a vivid look at the adolescent hostility simmering in a New England prep school, while American Wife considered the icy marriage between a first lady (modeled after Laura Bush) and her controversial husband. Her latest, however, is classically romantic. Published earlier this month, Eligible is a modernized retelling of Jane Austen’s Pride And Prejudice. 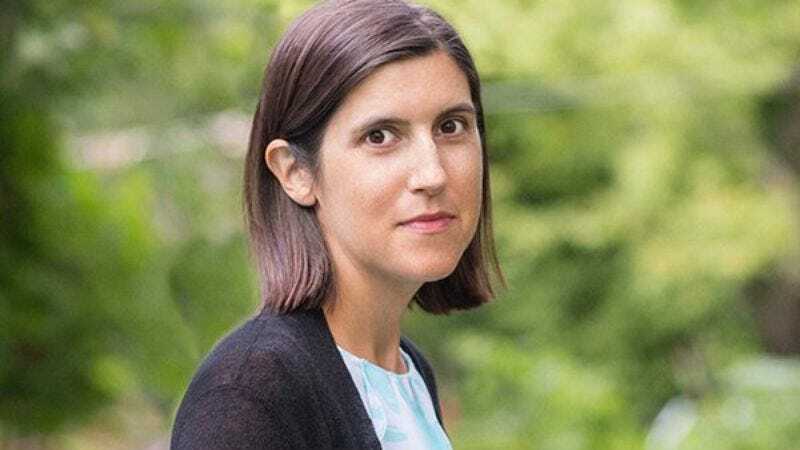 In honor of her book’s inspiration, Sittenfeld spoke to The A.V. Club about five other literary works that can get a reader’s heart aflutter. The A.V. Club: Was there any particular connective tissue that led you to choosing the five titles you did? Are they just favorites of yours, or are they ones that you feel are broadly revealing of romance? Curtis Sittenfeld: After I chose them, I was kind of re-reading and flipping through them, and I think for me, what makes the stories romantic is their emotional richness. The key is, do you as a reader want what the characters want, do you feel what they feel? That determines whether the story is romantic more than whether things end happily for the couple. AVC: On Chesil Beach isn’t a book with simple happiness. There are a lot of class issues, intimacy issues. CS: My favorite part of On Chesil Beach—I think it’s very beautifully written and insightful—but I also think the last couple pages are incredibly moving. I don’t think it gives too much away to say that the book takes a great leap into the future at the end. Basically, the book takes places on a wedding night of a young English couple in the early ’60s—there are some flashbacks to their courtship, but then there’s a jump ahead of 40 years or more. I feel like—well, I told my husband that I had picked this as a romantic book, and he kind of teased me about it. Depending on your perspective, this could be the most unromantic book ever written because it is basically about a disastrous wedding night. At the same time, it is really moving because it is a disaster in spite of the fact that the couple genuinely loves each other. That makes it much more interesting than a disastrous wedding night for two people who definitely shouldn’t be together. Who cares what happens to two people who hate each other? In fiction, it’s interesting to read about complicated characters who are neither appealing nor unappealing, about relationships that are neither successful nor unsuccessful. I think feeling ambivalent is interesting. AVC: There’s no one really at fault in what transpires here. CS: The characters are simultaneously at fault and not at fault. They’re both sympathetic. And again, I don’t want to give away spoilers, but I kind of like the fact that it is unclear whether they should stay together or not at the end, if their lives would’ve been better or more interesting had they stayed apart. AVC: Are you familiar with Richard Linklater’s Before series of films? This book was reminiscent of Before Midnight, the third film, which also covers one night and which raises questions about whether its central couple should or shouldn’t be together. CS: I love those movies. I think those are really well done. I’m 40 now, and feel like I’ve aged a lot with those characters, even though they may be a bit older than me. Those movies do a great job of showing character development through dialogue—how having those developed characters make the emotions matter so much more. AVC: This one has a little more of a political bent to it. CS: Which I like. I feel like for me—this might make me sound anti-intellectual—it’s almost hard to truly love a book that contains no romance or no sexual tension. I like it when a book combines romance and romantic tension with other subjects. That’s the ideal, to me. I view Trespassing as a kind of Pakistani Romeo And Juliet. You have the boy, Daanish, and the girl, Dia—I may be pronouncing those wrong—that’s one of the things that happens when you read a lot more than you speak—and what I like about the book is that I feel like their story sort of personalizes the political. AVC: Their struggle as a couple sort of mirrors the struggles of a post-Gulf War Pakistan. CS: I can see that. I’ll give you that. The book tells their story, but it also has a lot of flashbacks that kind of explain what’s going on in the region, the political currents. I really like having that as a backdrop for the romance. AVC: Here is another story about love in a time of big social upheaval. CS: I think this is such a fascinating book. I agree the book is about social change, but this is another one that is much more interesting and involving to me because it contains a love story. If it was just about social change, with no love story, I don’t think I would like it as much. However, it also does these incredibly interesting things with time—basically the time period the book covers doesn’t make sense, even though it works within the context of story. I went to a reading that Mohsin Hamid did and I asked about this. He said that basically the book is taking place over the present day, even though the main character goes from birth to old age throughout it. Basically he’s in an eternal present, which I think is a really cool idea. There are a lot of weird and smart things the book does. AVC: How do you feel about the second-person narration? CS: I liked it. It worked for me. It’s simultaneously written in the first and second person. Like, the protagonist is written in the second-person, but there’s also a first-person narrator telling the protagonist’s story. I really admire books that really get away with impossible tricks like that. More importantly, I think the love story it tell is very romantic, very full of longing. The man and the woman at the heart of it aren’t really together for most of their lives, but in a very powerful way they’re touchstones for each other. CS: This story was in The New Yorker a few years ago. It is about a woman who is a university student and who has a huge crush on her professor. She ends up working in a pub—she’s English. There’s a customer who comes in one day. He looks almost identical to her professor, but where she feels very bashful around her professor, she’s very brazen with the customer, while the customer is quite shy with her. She ends up having a physical relationship with him for months, wherein she pretends that this man is her professor. They hook up repeatedly, and she doesn’t really care about this guy, who is much more working class than her professor. This is another one that jumps ahead quite a ways—I’ll tell you the whole thing, so be forewarned if you don’t want to know the ending. It turns out that the student and her professor fall in love and get married, but it ends with her yearning for the guy from the bar, who she was so cavalier with. There’s this phrase in creative writing—attributed to Flannery O’Connor, though I don’t know if that’s accurate—that the end of a book should be surprising but inevitable. The ending of “The Surrogate” is a weird twist, but it feels surprising and inevitable. AVC: Like How To Get Filthy Rich, this short story also involves people being touchstones in each other’s lives. There’s a chance meeting, a promise to reunite in a year. CS: Have you read this one? AVC: This is a Munro I haven’t read. CS: Oh, you have to read it! It’s so good! I probably shouldn’t say too much about it because there’s a big twist in it and I feel like people would be better off going in blank. I’ll give you a little bit of it. Basically, there’s a young woman who lives a not-very-exciting life in rural Canada. I think it takes place in the early 1960s. The woman goes by herself annually to see a Shakespeare play. One year she ends up not at the theater, but nearby, meeting this man. They’re very attracted to each other, but she’s very inexperienced. They agree to meet in a year, and to not keep in touch between the time they meet and the following year. The book then describes what happens the following year, and then it jumps ahead decades into the future, where there’s what I would describe as a shocking twist in the story. As with what happens with “The Surrogate,” the ending here feels very surprising, but also inevitable the more you reflect on it. I’ve been haunted by this story ever since I first read it, which was maybe 10 years ago. AVC: A lot of your choices could be considered “tragic romances,” rather than ones with happy endings, which is what I default to thinking about when I consider romance as a genre. I’m interested in how you view these romances compared with Pride And Prejudice, given the premise of Eligible, as well as the fact that Pride is probably the quintessential swoon-worthy romance in literature. CS: The books I’m recommending have a lot of yearning and longing in them. I think sometimes wishing for romance is more romantic than actually experiencing romance or being part of a couple. A lot of these books light upon the uncertainty and the novelty of a new love, which can be eroded by time or familiarity. Something that’s interesting about Pride And Prejudice is that, as with many romances, it essentially ends with the wedding, or weddings, in some cases. It doesn’t show the marriage. It is all about courtship and uncertainty and insecurity and confusion. Something I like when I’m reading a book or watching a TV show is when there are two characters who are attracted to each other, but who have other commitments, or can’t act on their attraction because of decorum or their own shyness. As a reader or viewer, you’re just like, “Kiss! Kiss!” I love that feeling, when the romantic or sexual tension is so thick that you want characters to act on it. I think Jane Austen does that really well with Darcy and Lizzy in Pride And Prejudice. There are a lot of moments when there’s a discrepancy between how the characters feel and how they act—that can be very romantic. It can be torture, but it can also be very romantic. One common thread I think exists across the books I selected is their emotional richness. “Tricks” is incredibly rich, and you can’t be invested in the romantic state of a character if they’re not well developed. So it starts with the character development and then the situation matter. If you understand the internal conflict they’re going through, it’s very romantic.